June 12, 2008 Annapolis, MD: The Westlawn Institute of Marine Technology is pleased to announce that both Hargrave Custom Yachts and The Taylor Made Group have generously provided funding to create scholarships for Westlawn students. These scholarships are an important aid in enabling more students to afford their studies and complete their work. Support like this from boating industry leaders is crucial to ensuring a supply of trained personnel and thus the long-term health of the boating business. Hargrave Custom Yachts has funded a scholarship in memory of renowned Westlawn alumnus Jack Hargrave. It is the “Hargrave Memorial Scholarship Fund.” This scholarship is for advanced students enrolling in Westlawn Modules 3 or 4. It is effective starting June 15, 2008 and cannot be applied retroactively. Students enrolling in Module 3 or 4, with a grade-point average of 85% or higher, will qualify for a $500 scholarship. Students must have passed at least lesson 19 in Module 2 to enroll in Module 3. The scholarship award will be applied to students’ initial payment and first monthly payment(s) if they chose the monthly-payment plan. The scholarship will remain available on a first-come, first-served basis, for those students who meet the scholarship criteria, until the funds in the Hargrave Memorial Scholarship are expended. Westlawn students should be sure to take advantage of this opportunity to assist with their tuition for Module 3 or 4. For those interested in learning more about Jack Hargrave, a book about him is available from Westlawn at: Hargrave Book. Sales from this book are also donated to Westlawn. The Taylor Made Group has funded a scholarship in memory of Willard (Bill) Taylor. It is the “Taylor Made Scholarship.” This scholarship is for intermediate students enrolling in Module 2, who have done well in their Module 1 or Yacht Design Lite studies. It is also effective June 15, 2008 and cannot be applied retroactively. Students enrolling in Module 2 from either Module 1 or Yacht Design Lite, with a grade-point average of 85% or higher, will qualify for a $250 scholarship. Students must have passed at least lesson 10 to enroll in Module 2. The scholarship award will be applied to students’ initial payment and first monthly payment(s) if they chose the monthly-payment plan. The scholarship will remain available, on a first-come first-served basis, for those students who meet the scholarship criteria until the funds in the Taylor Made Scholarship are expended. Westlawn students should be sure to take advantage of this opportunity to assist with their tuition for Module 2. Students wishing to apply for either of these scholarships should contact Patti Schulte, Westlawn student services coordinator at pschulte@abycinc.org. 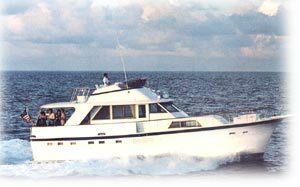 Hargrave Custom Yachts was originally known as the top yacht design firm in America when, under the direction of legendary designer Jack Hargrave, the company played an important role in the success of companies like Hatteras, Burger, Amels, Prairie, Atlantic, & Halmatic to name just a few. In 1997, shortly after Jack passed away, Michael Joyce returned to the company to take over as president and CEO. Recognizing that Hargrave was far more than a design office, Joyce explained to Boating Industry International Magazine that Jack's name was in fact a "brand name" and outlined his plans to begin construction of luxury yachts under the Hargrave banner. The Taylor Made Group consists of several manufacturing enterprises known for the quality of their products and the leadership of their technologies. Although the marine market is the Group's principal focus, its diversified capabilities enable it to compete in a number of other markets as well member businesses include: Taylor Made Products, Taylor Made Systems, Trend Marine Products, Water Bonnet, Taylor Made Technologies, Taylor Made Glass Systems, and Taylor Made custom Products.